This section of this article is continued from Part One HERE. The answer to question 3 above is yes, it does make sense. With the groundwork outlined, it’s now best to look at several experiments that validate Anderson Localization and actually show what it looks like. with l being the mean free path. This is a 2-D hexagonal photonic lattice with periodicity of 11.2 µm and a refractive index contrast of ~5.3*10-4, where Δn(x,y) contains a periodic term and fluctuations of the same average period superimposed on it. Both of the contributions to Δn(x,y) are z-independent (the direction of light propagation). The disordered lattice comes from the use of optical induction. Disorder comes from using a speckled beam (passing a laser through a diffuser) and adding it to the interference pattern of the ordinary diffraction pattern that the lattice already has. Disorder is defined as (total power of the speckled beam)/(total power of the lattice-forming beams). Data was taken over about 100 speckled beam and disordered lattice patterns over 12 levels of disorder (so ~1200 trials total) which all came from the same probability distribution. The probe beam was 514 nm and 10.5 µm FWHM. The scaling theory of localization says that in a 2-d system Anderson Localization occurs for any amount of disorder4. However, the more disorder, the more localization. The following figure shows what Anderson Localization looks like. Diagram c has 15% disorder, while diagram d has 45% disorder. The intensity pattern was fit with a Gaussian in d. By figure e, everything is totally localized and there is no more transport at all. This state of total disorder is Anderson Localization. Now we look at experiment 2 (from reference 5). This is similar to the previous experiment, but the phenomena of Hyper-Transport (the wave packet expands much faster than in ballistic transport while the width in momentum-space expands drastically) is considered. A probe beam was sent down a photonic medium that had spatial disorder and fluctuated in the propagation direction z (unlike the last paper). Once again there were many trials and ensemble averaging was used. 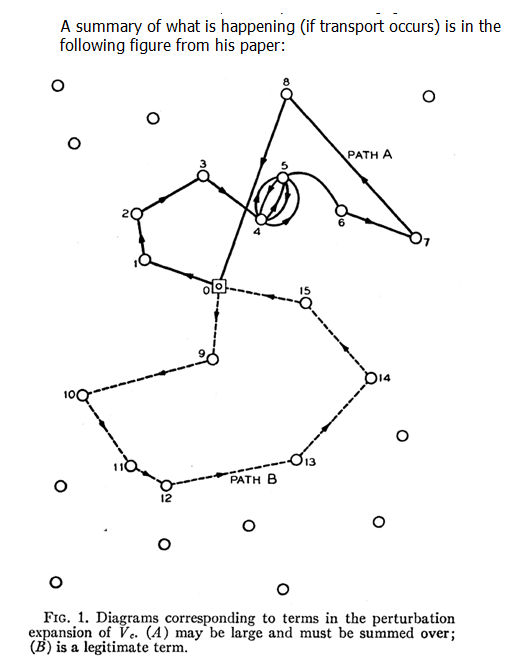 The 3rd experiment considered is from reference 7. This time consider a 1-d system, which is a wire. If one monitors the position of the magnet and current induced in the wire in the diagram below, then the entire wave field (amplitude and phase) are obtained. Anderson was right in his prediction about localized states. It has been clearly shown that Bloch wave functions can be made localized by introducing disorder (lattice impurities). Transport completely stops, whether one considers spins as in the original 1958 piece of work or the motion of electrons themselves (as in the experiments). This review has also looked at how much disorder is needed to have Anderson Localization. It is an interesting phenomena that will continue to be studied in the future with perhaps some time-dependence in the potential in systems that have already had Anderson Localization observed in order to see how it breaks down. In fact strong localization has never been observed in atomic crystals because of this reason2. 1. Anderson, P. W. Absence of diffusion in certain random lattices. Phys. Rev. 109, 1492–1505 (1958). 2. Schwartz, Guy Bartal, Shmuel Fishman, and Mordechai Segev, Transport and Anderson Localization in Disordered Two-Dimensional Phonic Lattices. Nature, March 1st 2007. 3. Lee, P.A. & Ramakrishnan, T.V., Disordered Electronic Systems. Rev. Mod. Phys. 57, 287-337 (1985). 4. E. Abrahams, P.W. Anderson, D.C. Licciardello, and T.V. Ramakrishnan, Scaling Theory of Localization: Absence of Quantum Diffusion in Two Dimensions. Phys. Rev. Lett. 42, 673-676 (1979). 5. 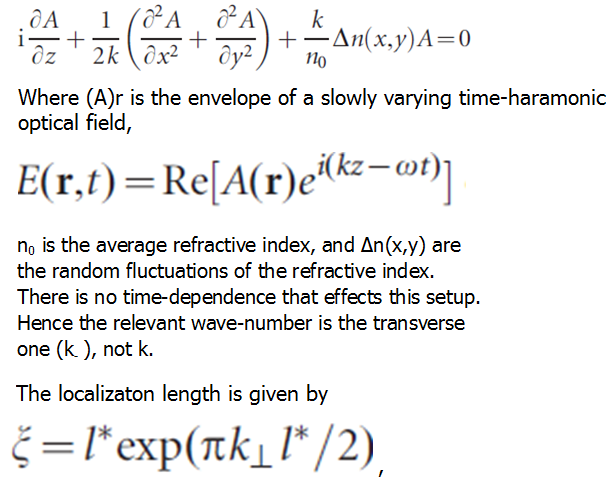 Levi, L., Krivolapov, Y., Fishman, S. & Segev, M. Hyper-transport of light and stochastic acceleration by evolving disorder. Nature Phys. 8, 912–917 (2012). 6. Mordechai Segev, Yaron Silberg, and Demetrios N. Christodoulides, Anderson Localization of Light. Nature Photonics, 27 February 2013. 7. Shanjin He and J.D. Maynard, Detailed Measurements of Inelastic Scattering in Anderson Localization. Physical Review Letters, Volume 57, Number 25 (December 22nd 1986). 8. Yoseph Imry, Possible Role of Incipient Anderson Localization in the Resistivities of Highly Disordered Metals. Physical Review Letters, Volume 44, Number 7 (February 18th 1980). 9. Supriyo Datta, Electronic Transport in Mesoscopic Systems. Cambridge University Press (May 28, 1997).